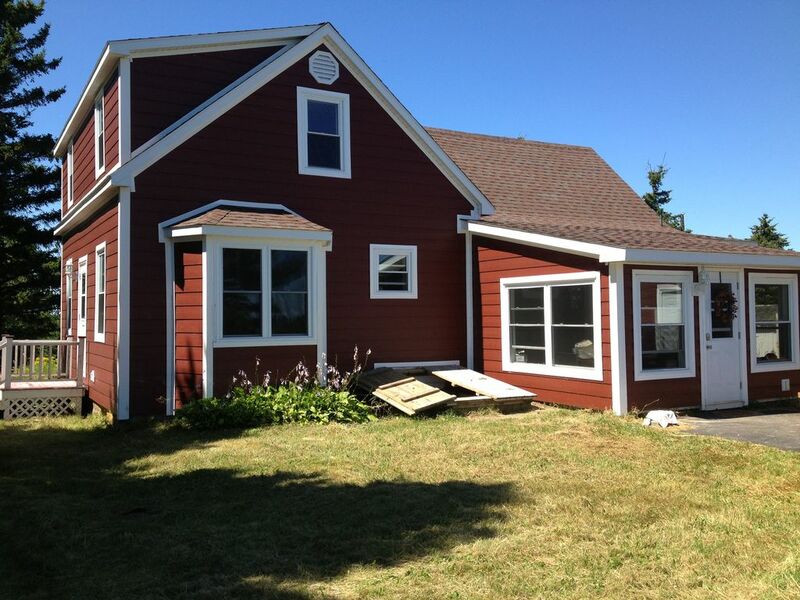 This renovated farmhouse is situated on the water with 3 acres & has shoreline in a calm bay. It has 3 bedrooms (2 Queen beds & 1 Double), Queen size air mattress with pump, 1.5 bath, sun porch, fully equipped kitchen, Outdoor BBQ gas grill with propane, spacious 12 by 24 outdoor patio, office space with wifi and a cozy TV Room. Enjoy campfires in the back yard, sun porch, swimming, boating or a trip to Martinique National Park or Pondville beach just a few km away. Groundswell Pub is a 5 minute walk away... they are licensed, serve food and live music on occasion. The Red House is a great home base to explore beautiful Cape Breton... Our Cabot Trail, Golf Courses, Beaches and Backyards. Outstanding views enjoyed from the wall of windows in the kitchen, the outdoor patio or the master bedroom. Follow a path to the shore at the end of the grass road or another path through the trees on the right. You will probably see deer tracks in the field. Please bring your choice of laundry detergent. Kitchen is fully stocked with dishes, cookware and utensils. Beautiful house, beautiful views. Nicest people in the world. We stayed for two weeks at this property. The breezes were cool. We slept with the Windows open each night. The villagers were charming and welcoming. The next door neighbor introduced himself and helped us find places to see. We felt we made a friend. There were beaches and trails to walk our dog. We visited the MikMaq tribes and found common ground in laughter and stories and native crafts. The house was comfortable and easy to live in. There were stores nearby and coffee shops. Both of us are fiddlers. We were able to attend a fiddler's festival to experience famous Cape Breton musicians. My wife and I stayed at this recently renovated home for 2 weeks in July 2018. It was in a quiet little town with good roads and a paved drive. We had access to the ocean a few hundred feet past the backyard. The home had lots of room, new appliance and a fully equipped kitchen. The deck afforded us shade in the afternoons when it was hotter. The home has a cozy feeling and made for great evenings. We would definitely recommend this property for long or short term rentals. Thank you very much for your positive feedback, John. I appreciate that you and your guest were very respectful of the property and that the house was left very clean. Happy to hear you had a great vacation & enjoyed our property. What a delightful place to stay! Beautiful, modern, everything we needed...and we enjoyed the area! Thanks for sharing your home! We enjoyed the lovely home, beautiful view from the deck, we had most everything we would need. We would suggest providing additional pillows for the beds. So happy to hear that you enjoyed your stay & the amazing views. We go that extra step to ensure that our guests are well taken care of. I wish you would have let us know about wanting extra pillows, we certainly could have brought additional ones to you. We assumed a king size and standard pillow would be sufficient for each bed. We stayed in The Red House June 10-17, 2017 and found it to be clean and very comfortable. The night we arrived there was a horrible wind that blew the BBQ right off the deck and broke it, but Evy had one there the next day for us. We were five adults and found the house to be perfect for our needs. We used it as a base location and did all our venturing from there. I wouldn't hesitate to recommend this property. Our family of 7 enjoyed our stay at the Red House. They loved the open space in the countryside and the opportunity to walk down to the ocean. The house was spacious and served our needs. We enjoyed exploring L'Isle Madame and its history. The Red House was a lovely place to stay, it served as home base for us as we travelled to a number of Cape Breton tourist attractions. This waterfront home has been totally renovated and offers modern conveniences and outdoor camp fires. Stay at the Red House while touring the Cabot Trail, visiting our many beautiful golf courses, the Fortress of Louisbourg, Celtic Colors Festivals, Acadian Festivals, or the annual Lennox Passage Yacht Club Festival which is just a short walk away. Enjoy the oceanfront home with outdoor camp fires, nature walks or just relax on the patio and enjoy the spectacular views. The Red House is found at Exit 46 off the 104 Trans Canada Highway, Eastbound. In 10 minutes, you will be at your destination. Take exit 46 and continue strait to a grated lift bridge. From this bridge, you will drive strait along the coastline for another 10 minutes until you arrive at The Red House. When you pass the post office on the right, a large turn awaits. Do not take this large turn. Yield to traffic & continue straight up to the Red House on top of the hill, water side.